Thirty-five students maximum are admitted to the Honors Program each year, making classes smaller so students get individual attention and greater access to professors. Classroom discussions are also lively and enriching. Honors classes are taught by full -time faculty that have demonstrated teaching excellence. They have won numerous teaching awards and are always highly rated by students. Students in the Honors Program have unique experiential opportunities, such as case competitions, speakers, and trips. Friendships that develop among the students in the Honors Program remain long after graduation and become a source of contacts and networking as the individuals progress in their careers. Honors students work closely with the director to help assure success. Each student is dealt with individually and their progress is frequently monitored. The director knows and assists each student. The honors designation on students' transcripts and diplomas are important for employers and graduate schools. Harvard MBA, Boston Consulting, Nike, Peace Corps, GE—honors graduates go on to do the great things they want to do. The Lundquist College of Business Honors Program provides challenging, stimulating, and enriching opportunities for learning, experience and opportunity. Each year, we form a new learning community with a cohort of thirty-five dedicated students. Working together with a select group of faculty, these students take classes that have been specifically designed for the Honors Program. They engage in experiences available only to Honors students and go on to do great things in the world. Success in the Honors Program is about more than just doing well in classes. You will need to engage in your own learning and experience and demonstrate leadership. You will represent the best of Lundquist College of Business, and the bar is high. A gift to the Business Honors Program is an investment in the leaders of tomorrow, enabling us continue to offer students an outstanding learning experience. A University of Oregon team took first place at the 2016 SAS Analytics Shootout Annual Student Competition. 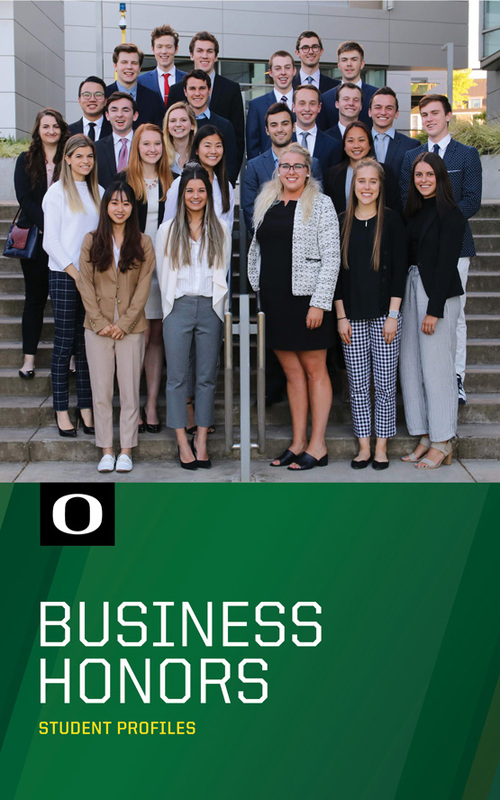 It is an exciting time to be part of the Business Honors Program at the University of Oregon. The Lundquist College's end-of-year ceremonies honored retiring faculty and staff as well as bestowed awards for service, teaching, and research. Undergraduate pre-business or business majors and community college transfer students interested in business as an area of study are encouraged to apply. High school seniors are encouraged to learn more about the Lundquist College of Business and the Honors Program. Information can be obtained from Eric Boggs at boggs@uoregon.edu. Applications are due by the end of week 5 during winter term. However, we do make exceptions for late applications. If you think you have missed the deadline, please contact lcbhonors@uoregon.edu. The following is an example schedule showing when required honors courses are typically offered. However, classes may not occur in this order. Consult the university's class schedule or an advisor for the most current information on course offerings. **NOTE: You cannot get credit for both FIN 311H and ECON 311. If you are considering the Honors Program, do not take ECON 311. How do I apply to the Business Honors Program? You can apply via our online application form. See above for more information. There are GPA requirements, an essay, two letters of recommendation, transcripts, and so forth. Please see above for specific details. Friday of week 5 at 5:00 p.m. winter term. I will not have my pre-business requirements completed by fall, should I still apply? Yes. You do not have to have all of them completed to apply or even to begin the Honors Program. When does the Business Honors Program start? Fall term your “junior” year (by credits not by years). If you came in with advanced credits, you may apply your first year to start your second year. Can I study abroad if in the Business Honors Program? Yes. You do need to be on campus fall, winter, and spring of your first year in Honors and winter of your second year. Otherwise, you can be abroad. Please speak to the director individually if you have further questions on timing. I am a UO student. Do I need to supply my UO transcript to you for admission? Yes, please do. Unofficial copies of documents are fine. I don’t meet the GPA requirements, should I still apply? Yes. If you feel you have strengths to share with our program then please apply. You are admitted based on a whole picture not just GPA. I am a freshman and don’t know if I should apply this year or next. What should I do? If you have more than twenty-five credits and plan to begin classes in the business school in the next year then you should apply now. You can always apply again the next year if you are not admitted this year. When will I know if I’ve been admitted to the Business Honors Program? Before spring term classes begin. Get to know our senior honors students. Potential employers interested in recruiting our honors students should visit our employer resources page or contact Career Services at 541-346-3301.